Silent Partner is about CIA agent Gordon Patrick (Moran) who is sent to Russia to investigate the "Death" of Mikhail Garin, a Russian government official. Gordon is met by the American Ambassador (Henry) to help in the case. Gordon finds out that Garin's death was suspicious and finds himself in the company of Dina (Reid) who may know information. Nick Moran is decent in his role. His character is not an action hero, so he does a good job in conveying that. Tara Reid actually does a good job. Her heart is into it and her Russian accent is not bad. 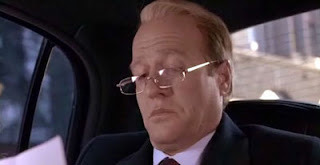 Gregg Henry is wasted though. He doesn't do anything. The action scenes are exciting. The car chase was cool and the gunfight was first-rate. Overall, Silent Partner is a fun action movie that keeps your attention.